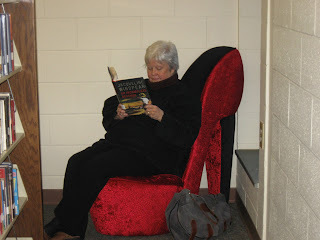 A library patron relaxes in the new "Shoe" chair in the adult fiction section of the library. Come on in and try it out. You'll be amazed at how comfortable it is. King Arthur, if he lived at all, is not the knight of traditional folklore but a king who presumably lived between Late Imperial Rome and the Dark Ages. This multidisciplinary lecture by Lars Nielsen includes a discussion of religion, philosophy, language and literature, and history. This Vermont Humanities Council event is scheduled for Saturday, January 12 at 2:00 pm. In case of bad weather, a snow date has been scheduled for the following Saturday, January 19 at 2:00 pm. This event is free, open to the public, and accessible to people with disabilities. Please join us! The Saxtons River Bell Ringers gave a truly magical performance last night at the library. Over 50 people attended!! 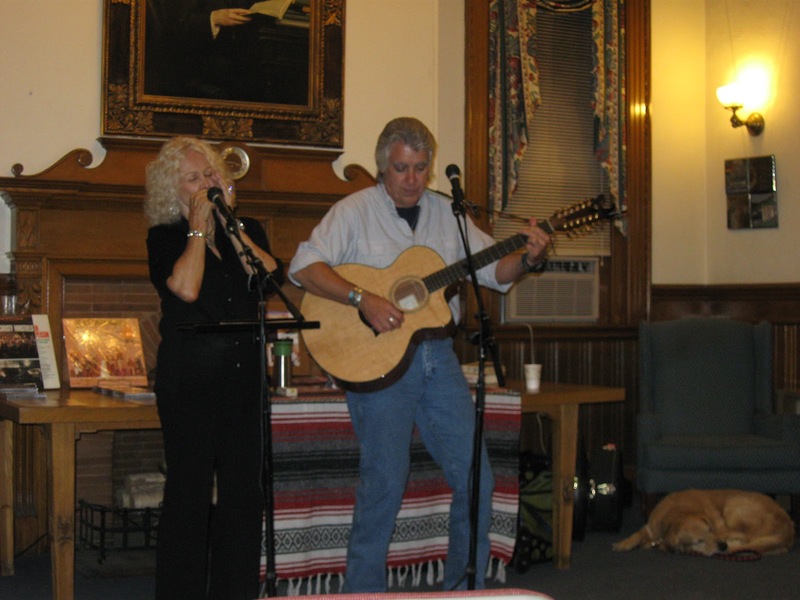 Jackie and Gary and their dog, Cooper entertained the audience Friday night in the Flinn Room. A good time was had by all. A copy of their CD, "This Land is Your Land" will be available for check out soon. The Saxtons River Bell Ringers will play holiday music on handbells on Wednesday, December 5th at 7:00 pm. In case of bad weather, a snow date has been scheduled for Monday, December 17th at 7:00 pm. Please join us for this wonderful performance. Join Lisa Helme, Director of Financial Literacy & Communications of the Vermont State Treasurer's Office at the Springfield Town Library on Tuesday, October 16 at 6:30 pm to learn how to organize your personal holiday expenses. This fun and informative program will show you how to make plans to s-t-r-e-t-c-h your resources and look at options for saving and budgeting. BE SURE TO SIGN UP BEFORE FRIDAY, OCTOBER 12 BY CALLING THE LIBRARY AT 802-885-3108.
. . . CONTINUING THE RICH TRADITION OF AMERICAN FOLK MUSIC . . .
Jackie and Gary combine 'classic' and original folk songs into an energetic, entertaining and fun show! There is alot of audience interaction, participation and humor . 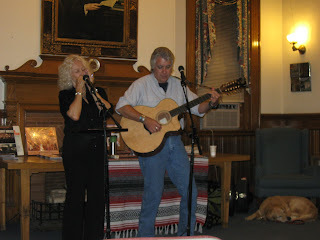 . . along with personal insight and stories with the songs they sing . 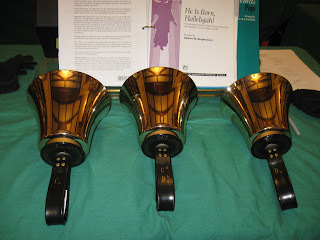 . . a very memorable musical experience! Nancy Somers, physical fitness expert and creator of Happiness Now Presentations, will present "Create the Life You Want To Live." Nancy will discuss ways to improve listening and communication skills, enrich interpersonal relationships and offer tips on maintaining brain health and setting and achieving goals. Her presentation style has been described as lively, fun and filled with humor. Ways to stay abreast of some of the happenings in town. 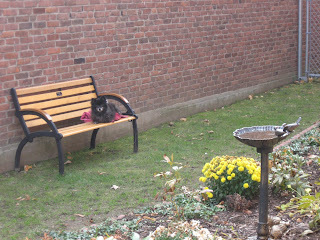 Go to www.springfieldvt.blogspot.com. The Springfield Police are currently posting the police log on this website. Visit the Springfield Police Facebook page to view additonal information and comments. Attend Springfield Select Board Meetings the 2nd Monday of the month at 7:00 p.m. This meeting is normally held at the Town Office. Missed the Select Board Meetings of July 16th and August 13th? The Library has copies available for check out. Looking for a good book to read? Have a book you can't stop talking about? The library has an aqua bowl overflowing with book suggestions. Here are a few : The Thief by Clive Cussler ; The Art of Racing in the Rain by Garth Stein ; The Language of Flowers by Vanessa Diffenbaugh ; The Best Exotic Marigold Hotel by Deborah Moggach ; The Snowman by Jo Nesbo ; Red Ruby Heart in a Cold Blue Sea by Morgan Callan Rogers. Beginning June 1st, we will be open Monday--Thursday from 9:00 am - 7:00 pm, Friday from 9:00 am - 5:00 pm, and Saturday from 10:00 am - 1:00 pm. Amy Howlett of the Vermont Dept. of Libraries and Sarah Lawton of Ilsley Public Library in Middlebury recently appeared on WCAX-TV Channel 3's program "Across the Fence", in recognition of National Library Week. They provided suggestions of recently published books for readers of all ages to enjoy. If you don't find it, please ask us, we may be able to request it from another library, or may decide to get our own copy. 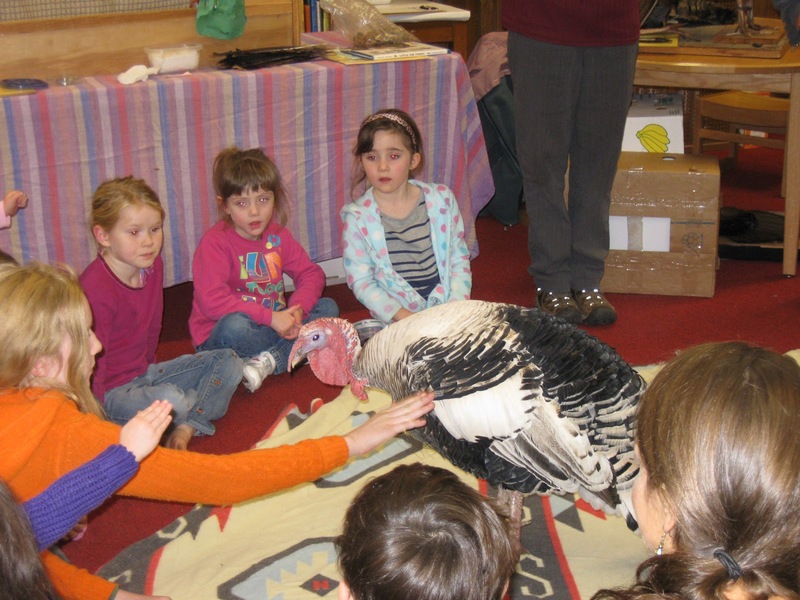 Spring Edition of the Springfield Town Library Newsletter is here! Follow this link to the latest edition of the Library newsletter. Here you may also sign up to receive the newsletter in your email four times a year. You will also notice book covers circling the screen, these are just some of the newest titles at the library. Thank you. Your answers will show how vital your library is to our community. Copies of the library newsletter are available at the Library and the Town Office. An online version of the newsletter will be available here on Monday, March 5, 2012. 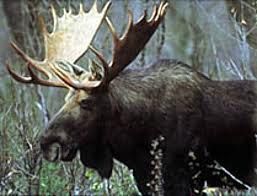 The Moose program with Forrest Hammond scheduled for tonight, March 1, 2012 at 6:30 pm has been cancelled due to bad weather. We will reschedule - so check our online calendar , this blog or the Library facebook page for updates! Thank you and travel safely. 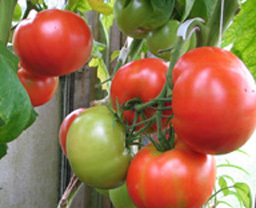 Help Growing Fruits and Vegetables! The seed catalogs and gardening catalogs are arriving every day in the mail and you might be thinking of trying something new this year. A strawberry patch? Some dwarf apple trees? Your library has books and other resources to help you get started. An online resource that is often overlooked is the County Extension Agent. Here is a link to the Extension's Fruit and Vegetable site! We had 13 people come to the library this morning with their eReaders, Kindles, and laptops to learn the basics about how to borrow digital eBooks and audiobooks from the library. Some folks wanted to know how to burn a digital audiobook to a CD, and one person wanted to learn how to create a blog! I'd like to send out a big "Thank you" to everyone who came. Your enthusiasm and interest in the "digital branch" of your library was infectious. For those of you who own Kindles and could not make it this morning, here is a link to some basic instruction.